I’m finally done with moving and the temp job. I needed a few days to recover and get back into my “garbage rhythm.” It’s great things are back to normal, or at least as normal as my life as a trash picker ever gets. I definitely feel much more free, determining my own schedule and doing what I love. I had a yard sale yesterday which made me around 110$ and helped me get rid of some of my excess stuff. I still have some major room organization to do, though. I also can’t find my battery charger so for these pictures I had to use my much inferior cell phone camera. I took a little walk last night in Outremont near Querbes, mostly just to relax but also to see if there was anything put out a bit early. I came across this big pile of old electronic equipment, including a few reel-to-reel players, an 8-track player, a few amplifiers, and a Beta cassette player. Fortunately one of my friends lives close by and with some help I dragged home the most of it that evening. Much of what we’ve tested so far has worked fine. My friend and I went back in the morning, mostly to pick up a bunch of old tape reels. There was a nice carpet that we left behind the night before in hopes that we could pick it up with her car but by morning it had disappeared. Regardless, we took all the reels, some cassettes and some 8-track tapes – many of which were of old Greek music. We explored Outremont by car a bit more after that. My friend found a working microwave, a chair, a pair of pants and some blinds, none of which I would have been able to save normally. We also saved a couple of spider plants from some black bags. Driving is an interesting change of pace. You’re definitely able to bring home bigger stuff and take a chance on electronics (the microwave, for instance) but generally I think you move around a bit faster and get a better feel for the trash while biking. It’s also a fair bit cheaper. This picture was taken in the morning, long after we carried away the audio equipment. I don’t have pictures of any of the audio equipment at the moment but I can show you a couple of my favourite “other” finds. 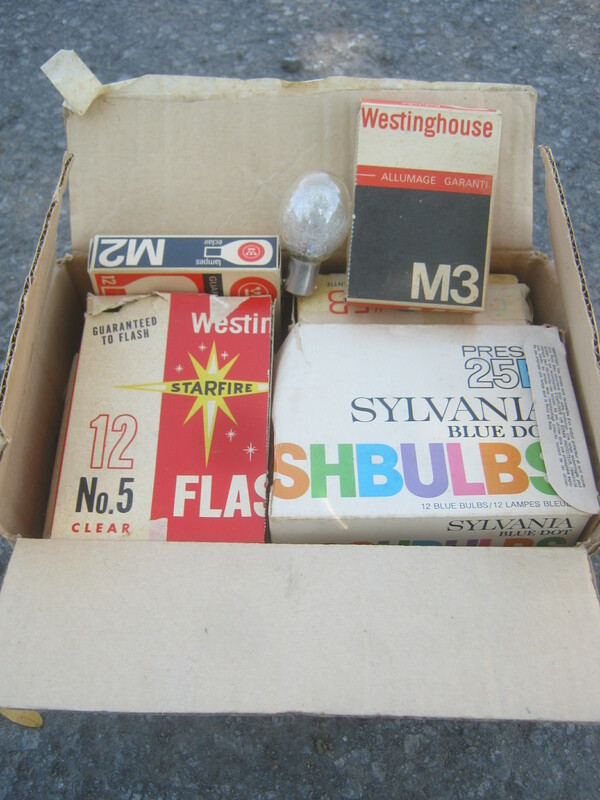 I actually found this box full of old camera flashes at the same place last Thursday. They look pretty cool, as if they have steel wool inside. 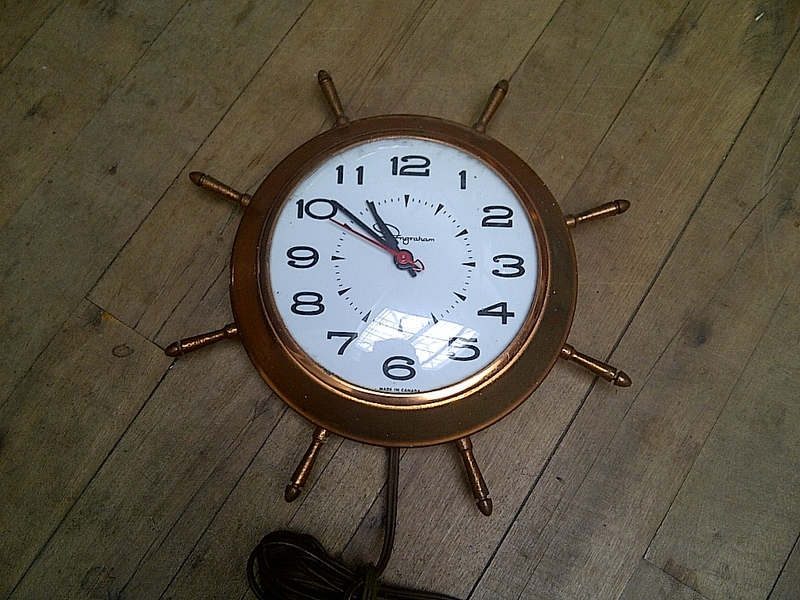 I really like this Ingraham plug-in wall clock. It’s got some vintage appeal, that’s for sure. I might put it up in my room. Once in a while I find something I have a special appreciation for. This little AM radio walkman fits the bill. I like how it has a built in speaker, which works quite well and is great for someone like me who doesn’t really like wearing headphones. I also enjoy the old-time sound of AM radio. I found a station last night, somewhere around the 1500 on the dial, which was playing oldies music. My friends and I listened to it for quite a while. I’m going to keep it, it might be useful for outdoors, or perhaps even to bring with my on trash runs. When I found this it had a battery included, which must have meant that whoever owned it before used it recently, at least within the last few years. I wonder why this stuff was thrown out. I’m definitely going to keep my eye on this spot going forward. I may take a little walk around the Mile End tonight. I have some work to do on my bike as well but I don’t anticipate that it’ll take too long. I also hope to track down that battery charger! 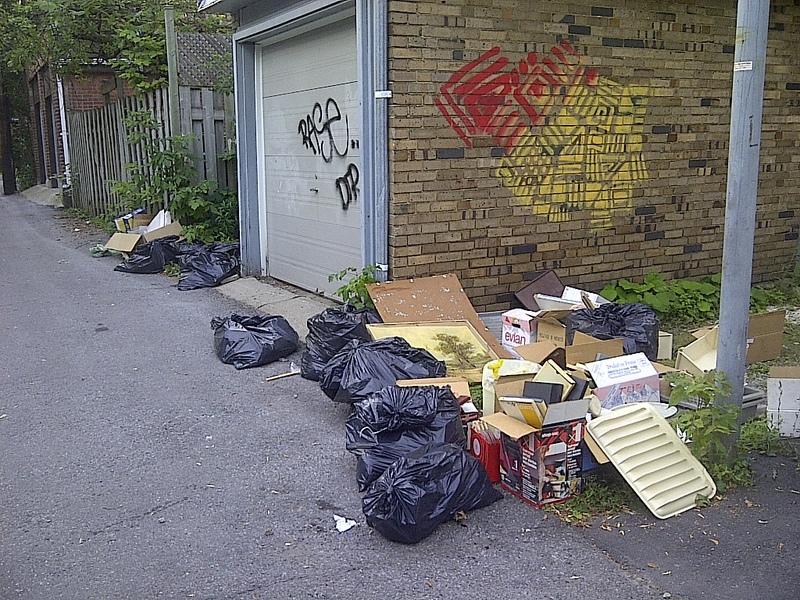 I want you to explore Outremont regularly on garbage days.My friend lives on Dunlop street and there is great trash to be found in Outremont.Check out Epee,Champagneur,Hartland,Pratt,Cote St.Catherine,Dunlop,etc every week. Glad to see you back. That’s a nice little nautical wall clock and great little transistor radio (great for when the power goes out). Even though your blog was on hiatus for 10 days or more,the number of your followers and readers has increased exponentially in recent weeks.You now have 1646 readers or subscribers to your blog,and your blog has registered 89,000 hits.I hope you will have 2000 subscribers before November. The radio isn’t a “walkman”, not only is that name a trademark of Sony, but even if used generically it would apply to something more recent, and something that had no speaker in it. One of the things about the Walkman was the headphones, you can get much better sound tightly coupling to the ear than trying to make a speaker sound good, especially in a small box. Is there a date on the battery? Unless a battery goes bad (and leaks), they may keep providing enough power to keep a simple radio like that going for some time. It’s not a good idea to leave batteries in things like radios, they may go bad and leak (which may damage the equipment). That’s a simple radio, more recent portables may end up using power for peripheral things and the batteries wear down fast. I just got a Sony DVD player on the weekend, complete with remote, and it has Sony batteries in it. The player came out in 2002, and usually you don’t see Sony batteries except for the first set that came with the equipment. The radio might be collectible. It’s AM only, which sets it before a certain time, and I don’t think Panasonic pocket radios after a certain point. Lots of companies did it in the beginning, then cheap imports flooded the market, not unlike Big Names selling 4 function calculators, then losing money as generic calculators came along. It wouldn’t bring in a lot, but it’s something to keep in mind. 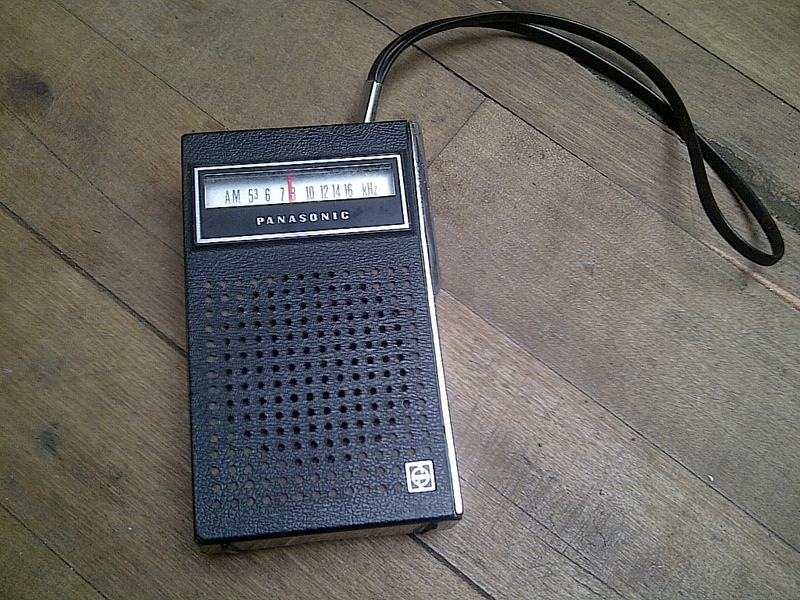 Pocket radios are still too “new” to have many collectors, but also the price hasn’t gone up, as with tube radios. I actually saw an odd radio on someone’s lawn on Saturday. There was supposed to be a street long sale, not sure if they closed early or postponed because of the rain, but I saw no sales. But there was this odd boombox. Taller but flatter than the average, you wouldn’t carry it on your shoulder. Fairly large speakers in the front. It also had 2 shortwave bands, something not that common. But, it also had a built in phono preamp so you could run a turntable through it, and output jacks to fee an amplifier if you wanted more sound, or to feed bigger speakers. I debated and left it there, then when I came back down the street, it was gone. I had no real use for it, but then I realized I should have grabbed it because it covered shortwave. I’ve been buying such radios when I see them in part because I figured if I stopped, they’d stop appearing, and I’d not get a chance at the ‘good stuff”. But I hadn’t seen a shortwave receiver this year, even was aware of that, so I should have grabbed it. Someone was taking a circuit board out of a large tv set further down the block, seemed to know what he was doing. So I figured he’d grabbed the radio too, so it’s not a complete waste.